"Prostrate junipers trimmed into a “bonzai” effect in front of Bowman H" by L. Michael Hill Ph.D. 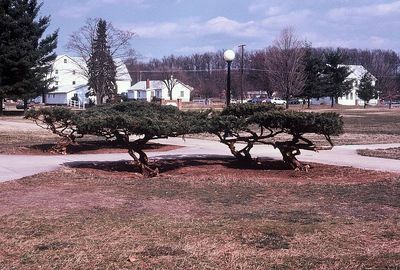 These prostrate junipers, Juniperus communus (Cupressaceae), were trimmed into a “bonzai” effect in front of Bowman Hall in 1987. Note the old College farm in the distance across Dinkle Avenue.